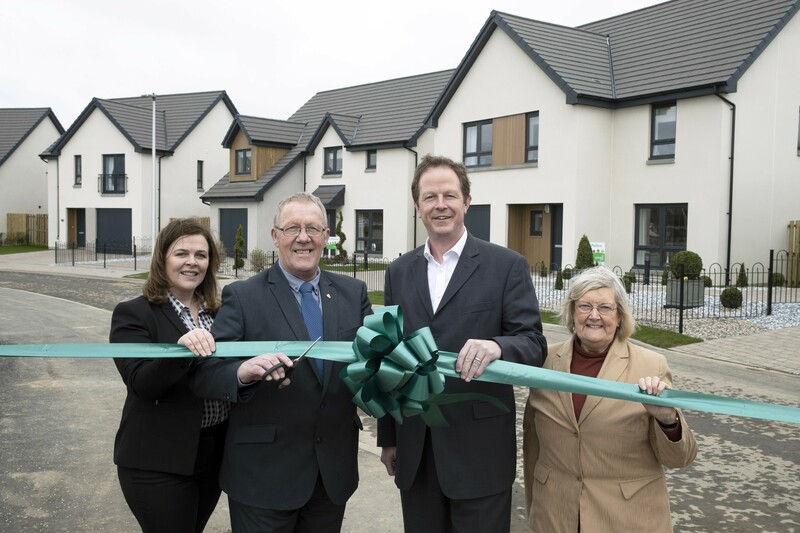 A major milestone has been marked at Springfield Properties’ new Bertha Park village as the doors to the development’s show homes were opened with help from local councillors, Ian James and Anne Jarvis. The private and affordable housing developer officially unveiled five-bedroom and four-bedroom show homes at the development in Perth this week, with a ribbon cutting ceremony and launch event. Construction is well under way and the opening of the show homes represents the next step towards delivering the landmark development, which has received recognition from the Scottish Government for its innovative approach to planning. The extensive site includes one, two, three, four and five-bedroom homes; opportunities for businesses like shops, hairdressers, estate agents, cafes and restaurants; a medical centre and the first purpose-built school in Scotland in over 20 years. It’ll boast everything required to create a thriving community. Springfield Properties is building a number of other villages throughout Scotland, including Durieshill in Stirling, Elgin South, Dykes of Gray in Dundee and Gavieside near Livingston. Cloch Housing Association is to cease developing and delivering Care & Repair and the Small Repairs Service for Inverclyde Council, bringing an end to an 18-year partnership. From April 1 the service will be delivered by another organisation after a 42% budget cut from the local authority proved unsustainable for the Association. Paul McVey, director of Cloch, said: “Cloch were involved in this service because it met with our values of helping those in need. The service did not make money for Cloch, but it did make a lot of people happy and secure. We provided a range of much needed services to older, disabled or vulnerable owners throughout Inverclyde. Through proper procurement channels, Cloch won the contract each time and has worked tirelessly to deliver high quality, responsive services to our clients. The contract will now be delivered by Bridgewater Housing Assciation. The xouncil is aware that the steeple clock has stopped and it will be removed by specialist contractors for protection, stored, serviced and restored at the end of the project. On completion of the Courthouse works, Members will review the best use of the building for future events. Believed to be among the first of its kind for the private rented sector in Scotland, the new app and website provides a 24/7 photo and video reporting platform and aims to provide convenience to both tenants and landlords when communicating about property maintenance. SLE members collectively provide approximately 9,000 private rented homes in rural areas, the second largest provider of rented housing stock after local authorities and housing associations in Scotland’s countryside. The technology, developed in partnership with Direct Software Group, utilises a structured form to ensure the right details are submitted first time about required repairs – information which can then be easily forwarded by landlords to contractors to allow repairs to be undertaken more quickly. The system can also be used to schedule alerts and reminders for maintenance to be carried out in future months and years. Hanover (Scotland) Housing Association has repeated its call for local people in Moray to suggest names for its new social housing development in Elgin, having already received excellent suggestions from the community. The Association is building a development of 44 homes near the site of the old hospital at Spynie in Elgin and is asking people to suggest names that reflect the history, culture and heritage of the local area. The deadline has been extended to March 30 and the entrant who submits the winning name will receive £50. To date, the Association has received a rich selection of names including Bishop’s View as a reference to Spynie Palace the ancient seat of the Bishops of Moray and The Quarrels after the nearby Quarrel Wood. The name Spynie Heights was suggested by a few entrants to celebrate the area surrounding the development. The site is being developed in partnership with Health & Social Care Moray (the new Integrated Joint Board involving Moray Council and NHS Grampian), and the Scottish Government, and is being built by Robertson. The new homes are expected to open in September 2019. Budding builders of the future have been given a special tour of a GHA new-build site. Youngsters from Bellrock Nursery in Cranhill had a look around the site where new GHA homes are being built. The tour was organised by GHA’s contractors on the site, Engie. The kids donned their hard hats and saw forklifts, diggers and dumper trucks in action. Work on 53 new GHA homes in Bellrock Street started in September last year. They should be ready in early 2020. Construction firm Morris & Spottiswood has engaged local school children in a novel site safety project as part of a contract involving Govanhill Housing Association. The fit-out, M&E and maintenance specialist is currently delivering a large programme of refurbishment work to tenement housing in Annette Street. In a bid to raise interest with local youngsters the company has formed a partnership with neighbouring Annette Street Primary School, run by Glasgow City Council. Morris & Spottiswood HSQE business partner, Kirsty Spence, who is leading the outreach work, said team members had recently visited the school to deliver special presentations raising greater awareness of construction site safety. The firm has further held a health & safety poster competition with the winning design professionally printed and displayed on large billboards around the site. 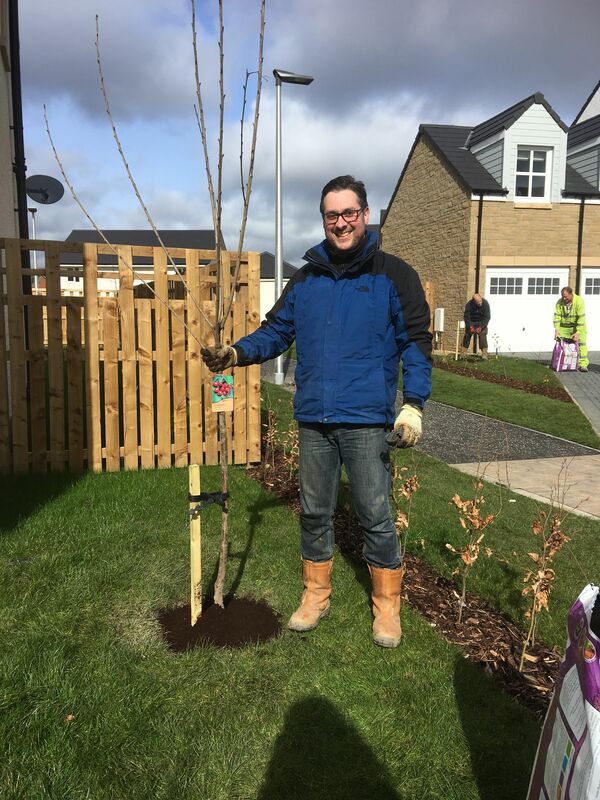 A developer has welcomed new residents to its Calderwood project in West Lothian with free fruit trees for the front garden of properties. The offering is an annual initiative by Stirling Developments to encourage biodiversity. In the fullness of time, it is hoped there will be an orchard running through the development which will encourage biodiversity, community activity and enhance the streetscape. It has proved to be a great opportunity to get out into the community and meet new residents – and many fruit trees planted in previous years are already bearing fruit. Stirling Developments was delighted by the fruit tree uptake from residents this year, with over fifty fruit trees planted around Calderwood in one day. The development company secured planning consent for new village Calderwood for 2,300 homes in 2014. Since then, over 350 houses have already been delivered and, in terms of occupations, has been one of the fastest selling sites in Scotland. Phase 3 of the development is now under way and is set to be the most exciting phase yet, with plans to deliver additional business opportunities, village centre and a new primary school.